A mourning dove considers calling a travel agent. This fellow loves sunflower hearts or chips and spring. And in today’s views: Butterfly dreaming on such a winter’s day. Here is a red admiral from last summer. Have you ever lost a contact lens in the snow? 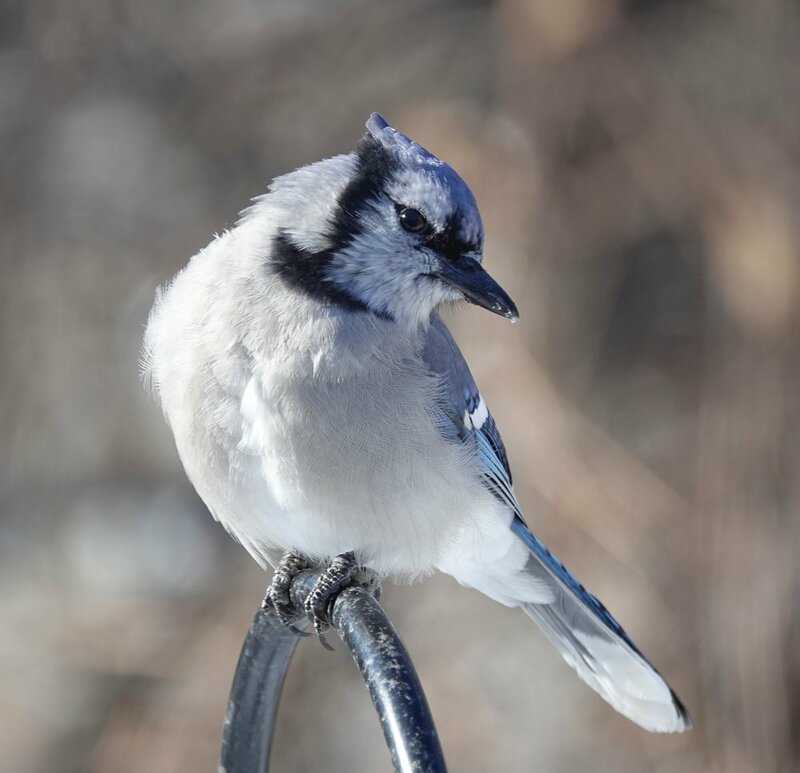 Curiosity paid off when this blue jay spotted two identical snowflakes. Hopping down the bunny trail, running down the rabbit trail and capering down the cottontail trail. House sparrows playing a disorganized game of Duck, Duck, Gray Duck. 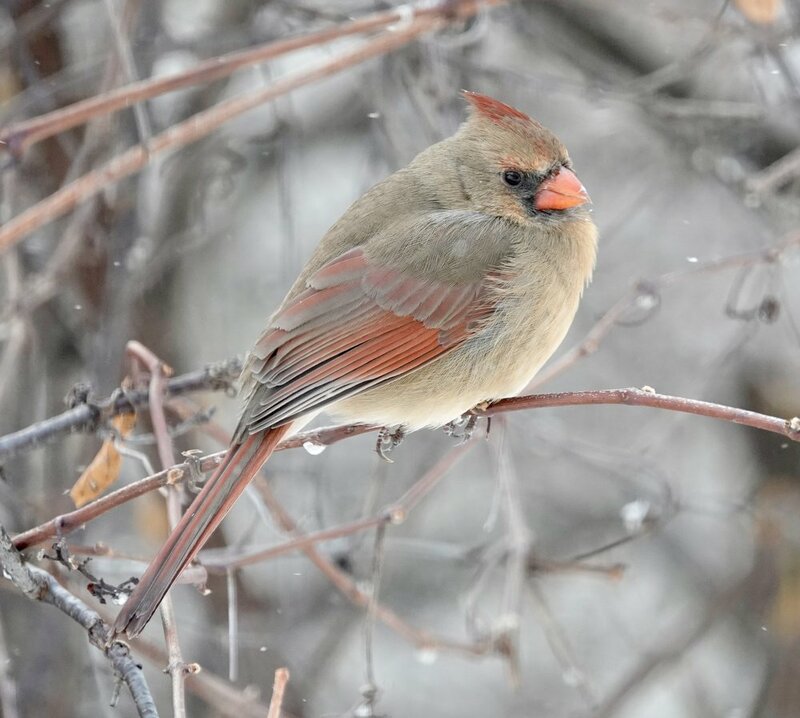 This pensive female cardinal may be California dreaming on such a Minnesota winter’s day. 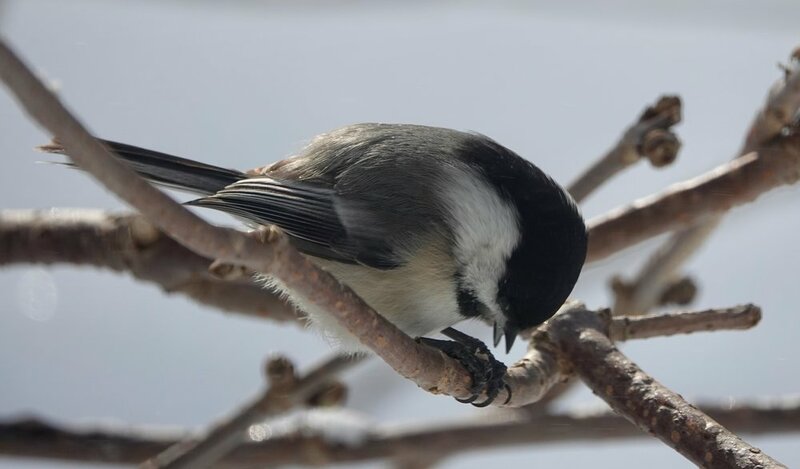 A chickadee eats lunch in the sticks. Bird feeders cast long shadows. 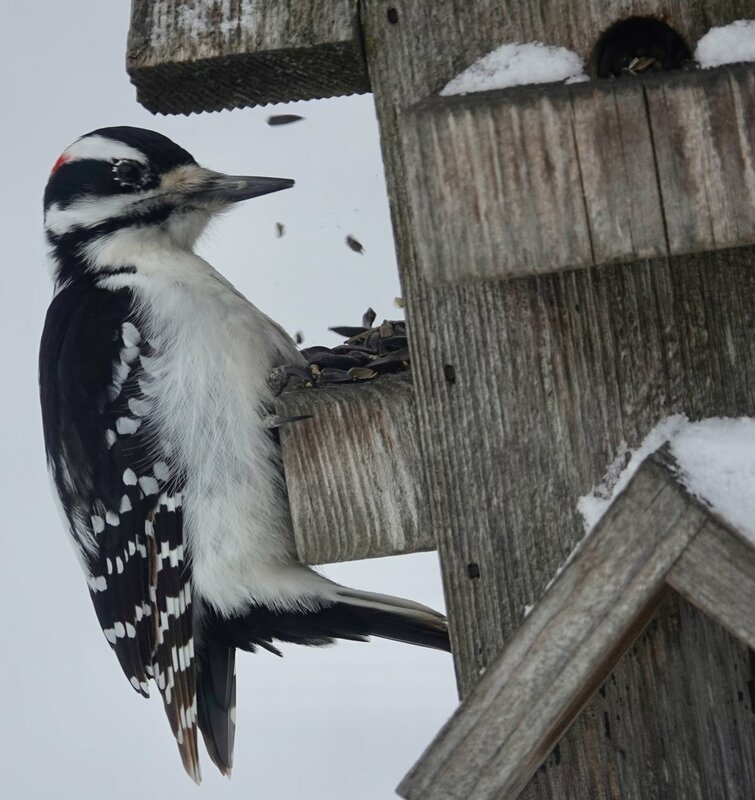 Downy woodpeckers often prey upon suet. A foot of fresh snow looks very much like the sky. And in today’s views: a jaunty junco. The weather makes us wonder. There are winter days when it seems as if everything I might be even remotely interested in has been canceled due to the weather. That’s when nature and its great family of things come to the rescue. I watched rabbits dancing by the light of the moon. Red osier dogwood and willows are showing more color as if they had acquired tans. February is National Bird Feeding Month. Schools closed a number of days to honor that fact. Feeders attract many species of birds, each one an unexcelled beauty. American tree sparrows eat under the feeders. Poorly named, they nest on or near the ground. Woodpeckers drum on resonant wood, making Pinocchio nervous. 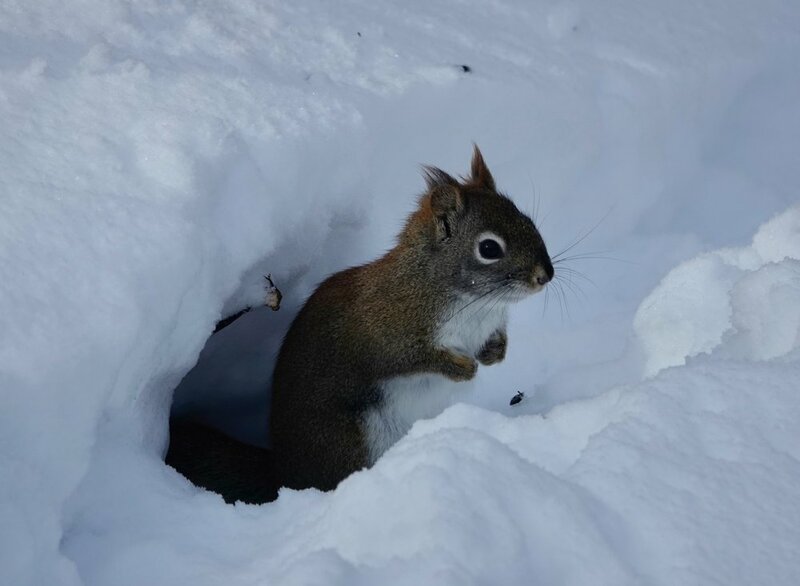 Red squirrels moved through shallow tunnels in the deep snow in the yard. Traffic backed up. One squirrel was peeking out of a hole, checking for those on its enemies list, when another squirrel goosed it from behind. The lead squirrel shot from the hole as if it were a miniature rocket launching from Cape Canaveral. “What do you know about racing pigeons?” I know I can’t beat them. Pigeon racing is the sport of releasing trained pigeons, which return to their homes over a carefully measured distance. The time it takes a bird to cover that distance is calculated and compared with other race contestants to determine the winner. “Why are some opossums so much darker than others?” The pelage color of an opossum is influenced by genetics. “You wrote about seeing hummingbirds in Alaska. How do they survive winter?” They have no down feathers and have a high metabolism, but Anna’s hummingbirds are tough. They depend upon flowering plants and shrubs for as long as possible, and frequent hummingbird feeders. They are able to slow their metabolism by entering a state of torpor. “How do squirrels find food under the snow?” Smell and memory. Studies suggest that squirrels bury food in a series of locations that help form a cognitive map of storage locations. A study done at the University of Richmond found squirrels recover about 26 percent of the nuts they bury. Squirrels are likely to bury red oak acorns because they are less likely to decay in the ground. Squirrels generally consume acorns of white oaks immediately because they germinate in the fall and as they germinate, grow a thick taproot that squirrels don’t like. “How far does a coyote travel?” Solitary coyotes travel over large areas, up to 60 square miles. Young coyotes that disperse often travel 50 to 100 miles (with up to 400 miles documented) in search of a vacant territory or a mate. Adults could move 10 miles a night throughout their territory. Kent Spellman wrote, “I wanted you to know that the cover article in this month’s Minnesota History Magazine is about Alden farmer, Albert Lea Audubon Society member and conservation crusader Bill Bryson. The Albert Lea Library has a copy of the magazine. pesticides and other environmental conditions. 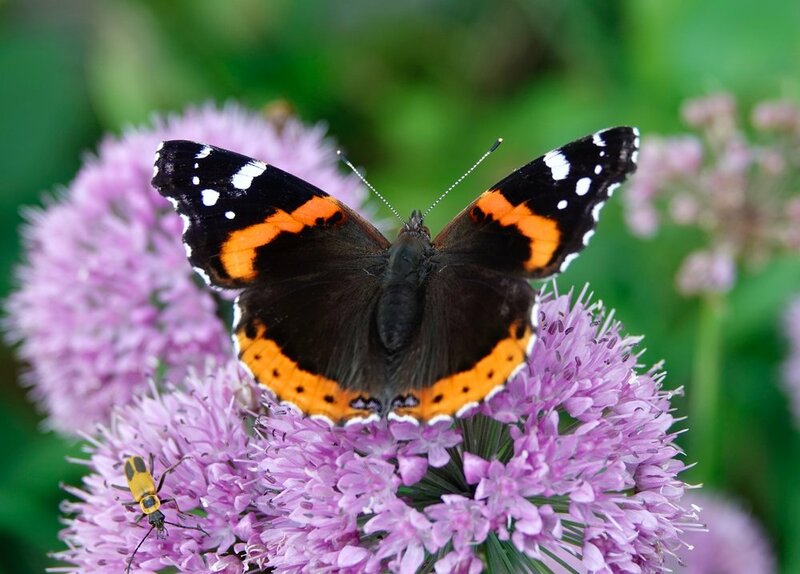 A University of Florida study found the number of caterpillars and butterflies in North Florida has been declining since 1985 and has dropped by 80 percent since 2005. University of Michigan and Stanford University researchers found carbon dioxide from car and factory exhaust reduced a natural toxin in milkweed that feeding caterpillars use to discourage parasites. I was happy to find a tent for my tent in Montana. A friend is in Hawaii, enjoying endless beaches. I’m in Minnesota, enjoying endless snowbanks. We are both living the dream, but I do dream of less snow. Their choice of a getaway car was to prove the downfall of the novice bank robbers. A window showing nature’s artwork. Available at a freezing artist sale. It’s a winter wonderland. I wonder when it will relent? All roads lead to being closed. A squirrel mines for cached food. The yellowing bill of a starling indicates the lengthening daylight. A feathered fish fillet knife. I’ve heard the pine grosbeak called a “mope,” because of its slow-moving tameness. The American tree sparrow nests on or near the ground. 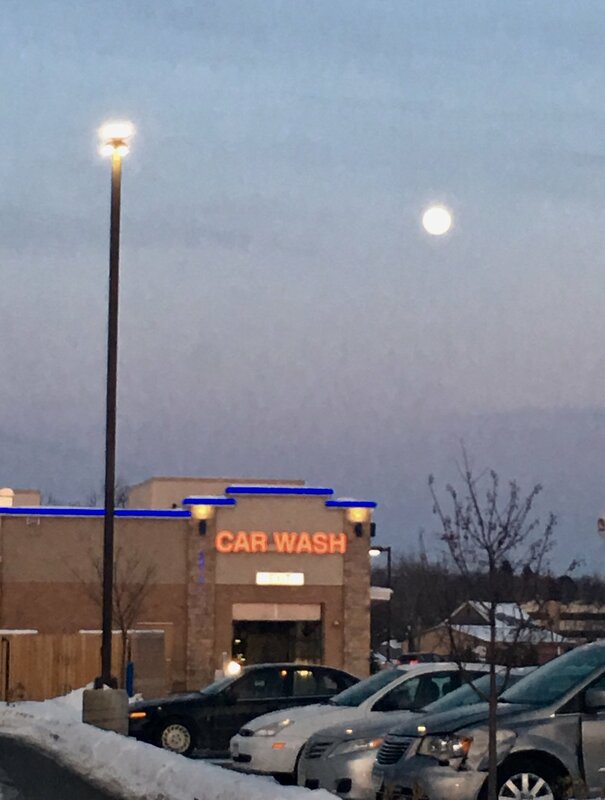 The super snow moon is also called the moon over the car wash. The cedar waxwing could have knocked me over with a feather. I tromped around the yard, happy to be a speck in the universe. Our yard is my local park. It’s important. Every place has an ecological significance. 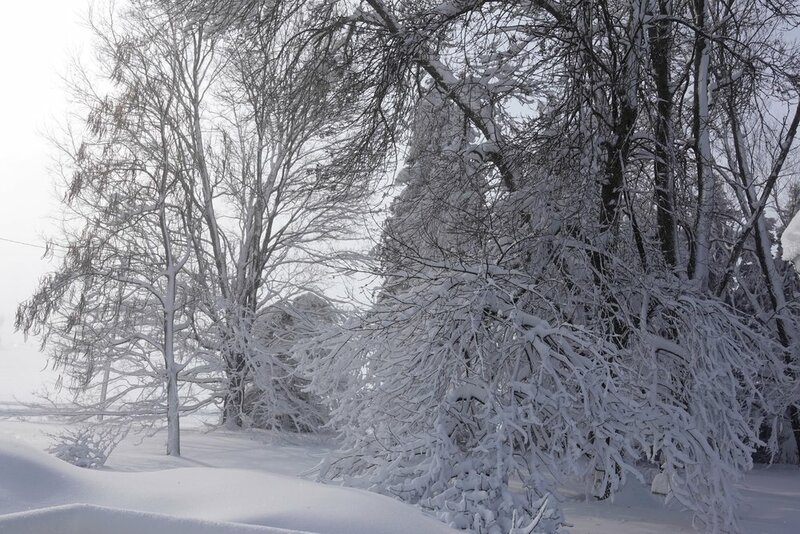 The landscape had fallen into a white silence. I walked through the snow, following in my own footsteps. Blue jays and chickadees were vocal. I appreciate chickadees. I do more than appreciate. I’m their cheerleader. I wonder if there is a sports team nicknamed the Chickadees? If not, there should be. 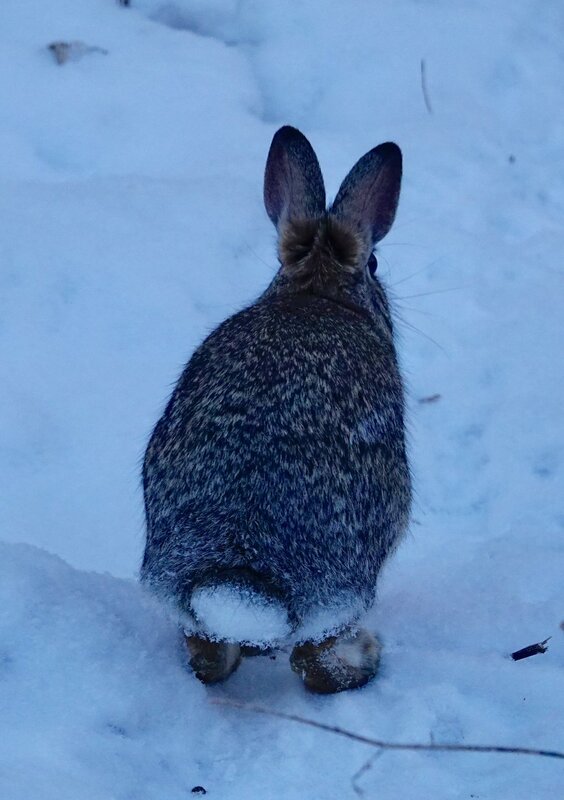 I investigate familiar tracks. I hear them called trash pandas, but I call them noisy raccoons when they wake me at night. I’ve been seeing a pair of cardinals at my feeders all winter. I enjoy their company. This day, I saw only the male. I vowed to look harder for the female. I hoped she still survived. 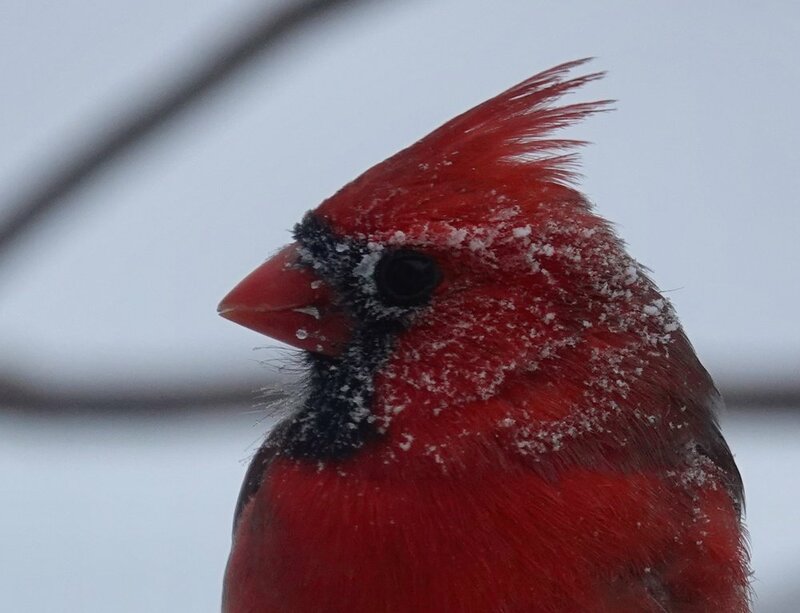 Cardinal pairs might stay together throughout winter, but the Cornell Lab of Ornithology found as many as 20 percent split up by nesting season. I hope the local pair of redbirds had an amicable divorce. I was in Alaska before Thanksgiving and was entertained by the antics of Anna’s hummingbirds in Haines. They were still being seen in that fine city in January. This hummingbird either doesn’t migrate or migrates short distances to more desirable feeding areas. They are found wintering in the Pacific Northwest. The northernmost observation of Anna’s hummingbirds in December, January and February are those seen in Haines. Christopher Columbus wondered if Anna’s hummingbirds were a cross between bird and insect. They were sometimes called flybirds. I saw a belted kingfisher not far from my home. It’s a species that goes as far south as required to find needed resources. I’m thankful to have had the opportunity to evolve in concert with nature. “Is wild asparagus a real thing?” In the 1960s, Euell Gibbons wrote a book about eating wild edibles titled, “Stalking the Wild Asparagus.” I enjoy asparagus. One of my father’s favorite dishes was creamed asparagus on toast. Our asparagus patch was treated with respect. It seemed as if everyone grew asparagus. The wild plant we commonly see along roadsides is the same species as tame asparagus — Asparagus officinalis. Wild asparagus produces without human assistance or manipulation. Asparagus plants are insect pollinated and its seeds are spread by birds, allowing domesticated crops to escape into the wild. “What is Smokey the Bear’s middle name?” The. “What causes deer to drop their antlers?” Diminishing daylight and falling hormones following the breeding season initiate the antler-weakening process. Testosterone controls the antler cycle, but production of testosterone and the annual antler cycle is ultimately controlled by photoperiod. Large-antlered older bucks typically shed their antlers earlier than young, small-antlered bucks. Weakened bucks may shed earlier than those in better physical condition. Genetics has some effect on the time of shedding. “How are cormorants able to feed in muddy waters?” The birds rely on vision to hunt in clear water, but their sensory abilities are limited in turbid water. I suspect they change from visual to tactile cues to maintain their foraging efficiency. “When it’s over, I want to say: all my life I was a bride married to amazement. I was the bridegroom, taking the world into my arms. The hole in the snow turned out to be a red squirrel cave that it used as a subway system for safer traveling. Angel wings in the snow made by a blue jay. Is this Jim Fowler or Marlin Perkins? I went for a lovely walk on a -7 degree, sunny morning. I was accompanied by twittering juncos and barking sundogs. An American goldfinch popped up in front of my camera. And in today’s views: a bad photo of a skilled fisher. A red-bellied woodpecker finds a way to turn its world upside down. Crows are happy they aren’t waterfowl. And in today’s views: trumpeter swans. Birds are stunningly amazing and amazingly stunning. A blue jay misses the cut. 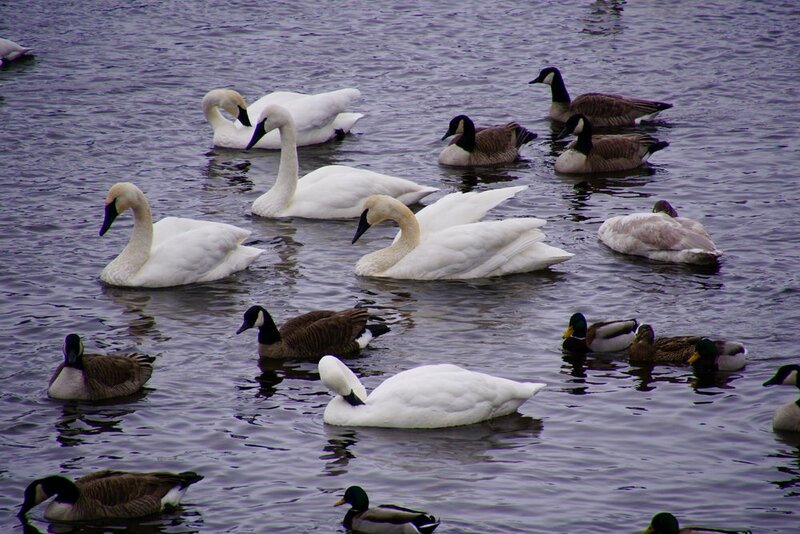 The Minnesota Chapter of the Appreciation of Trumpeter Swans meets. The thingamajig with the doohickey connected to the whatchamacallit brought good news. The eastern North American monarch population estimate for the winter of 2018-19 has a population size of about 15 acres, according to World Wildlife Federation Mexico and the Comisión Nacional de Áreas Naturales Protegidas. This is the largest population since 2007 and an increase of 144 percent over last year. The Monarch Joint Venture reminds us that everyone can make a difference for monarchs by creating habitat, educating others and monitoring monarchs. The weather report had been threatening. A volcano of winter had erupted. It was cold enough that my imaginary fire log went out. You don’t need to touch the flames to feel the warmth. I leaned into the wind. The wind leaned back. 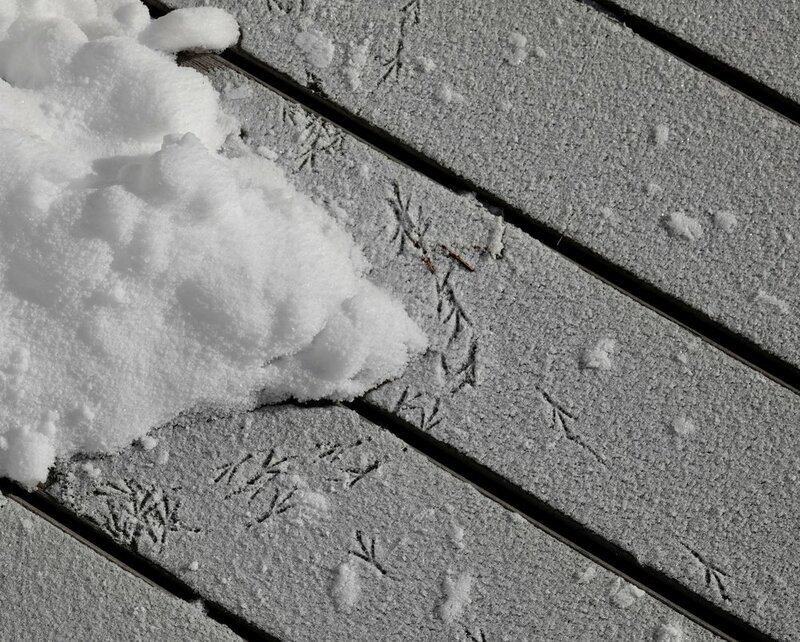 A canvas of fresh snow showed the marks made by small travelers making their way to here and there. I’m glad they shared their tracks with mine. I look and wonder. No walk is just a walk. There were rainbow-colored sundogs in the sky. They were caused by the diffraction by ice crystals. I’d checked with Hartland Harry, our local groundhog. He woke up a bit cranky. He told me he had no idea when winter would end and if he did, he wouldn’t tell me. He differs from Punxsutawney Phil. If Phil sees his shadow, Phil says we’ll have six more weeks of winter. Harry is from Minnesota. He’d say we’ll have only six more weeks of winter. “March of the Penguins” was a great documentary film. The “March of the Pine Siskins” would be, too. Many of the tiny birds had found the feeders in my yard. 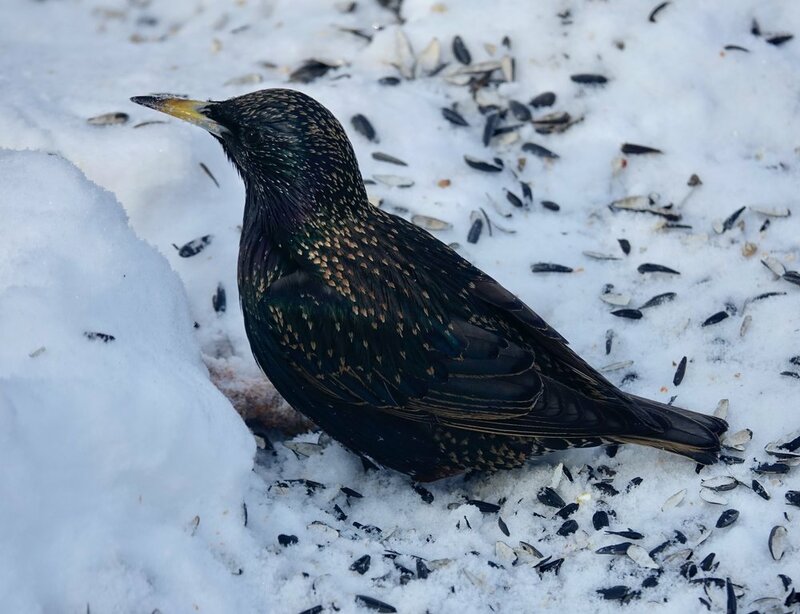 They joined other birds in a feeding frenzy that heralded nasty weather. The bills of some starlings had begun to turn yellow. Even at nearly -30, that’s a sign of a nearing spring. I headed down the highway, looking at the road and glancing at raptors. Red-tailed hawks patrolled highway margins. When snow covers much of raptors’ hunting grounds, highways allow a prime place to pursue prey like voles. I drove in the vicinity of Albert Lea High School. There was a wild turkey standing nonchalantly in the middle of the road as cars went by on both sides of the big bird. It was obviously a turkey with street smarts. Birds are important. I watch a good number of high school athletic events involving teams from the Big South Conference. There are 13 teams in that league. Six of them are nicknamed after birds. New Ulm and Windom are the Eagles; Fairmont, Luverne and Redwood Valley are the Cardinals; and Waseca is the Bluejays. “Are there any athletic teams nicknamed for plants?” There are. This list is by no means inclusive and some are named for parts of plants, but here you go. The one I am most familiar with is the Blooming Prairie Awesome Blossoms. Others include: Ohio State Buckeyes, Toronto Maple Leafs, Moorhead Spuds, Indiana State Sycamores, The Roses (an English rugby team), Scottsdale Community College Fighting Artichokes, Delta State (Mississippi) Fighting Okra and the Cedar Rapids Kernels (a minor league baseball team). There used to be another minor league baseball squad in California named the Visalia Oaks, but they changed their nickname to Rawhide. I’m sure there are more plant-based nicknames. “Why do blue jays carry so many seeds in their mouths?” It’s because they don’t have pockets. A hairy woodpecker is a magician that makes the sunflower seeds fly. A hairy woodpecker has woodpecker feet that are zygodactyls: two toes forward, two behind. This makes buying shoes a pain and is why you seldom see a woodpecker in a shoe store. Sundogs have proven to be loyal this winter. I love to walk. I follow in my own footsteps. This cardinal just heard the weather report. And in today’s views: A bodacious black-capped chickadee. Why it’s called a red-tailed hawk. A male Baltimore oriole has been hanging around Le Sueur, Minnesota, all winter. He likes the town and folks have been feeding him grape jelly. Feeding jelly is a challenge when that foodstuff can freeze so quickly. The female downy woodpecker forages in inferior winter hunting grounds as the male claims the prime natural locations. And in today’s views: A crow puts on some mussels. It was a good day to be a spectator. How we measure snowfall amounts in Minnesota. Patience is a virtue even at -20 degrees. This was how high Paul Bunyan had predicted the snow would be this winter. The thornapples were snow-capped this morning. A feather out of place on this Eurasian eagle owl at the American Bald Eagle Foundation in Haines, Alaska. It’s not the Flintstones’ newest vehicle. It’s a fish wheel, a water-powered device used for catching fish. In today’s views: Our national bird. “You bought kale?” I say. We’d just received somewhere between 8 and 143 inches of snow — most of it parked illegally. It reminded me that Harmony became the Minnesota state annual precipitation record holder by receiving 60.21 inches in 2018. This proves that planning and hard work pay off. Harmony crushed the old record of 56.24 inches set by Waseca in 2016. A downy woodpecker flew in as I was filling the feeder. I wondered if a downy finds winter weather a downer? I told it about Harmony’s record in hopes it might bring cheer, but the woodpecker wasn’t interested. 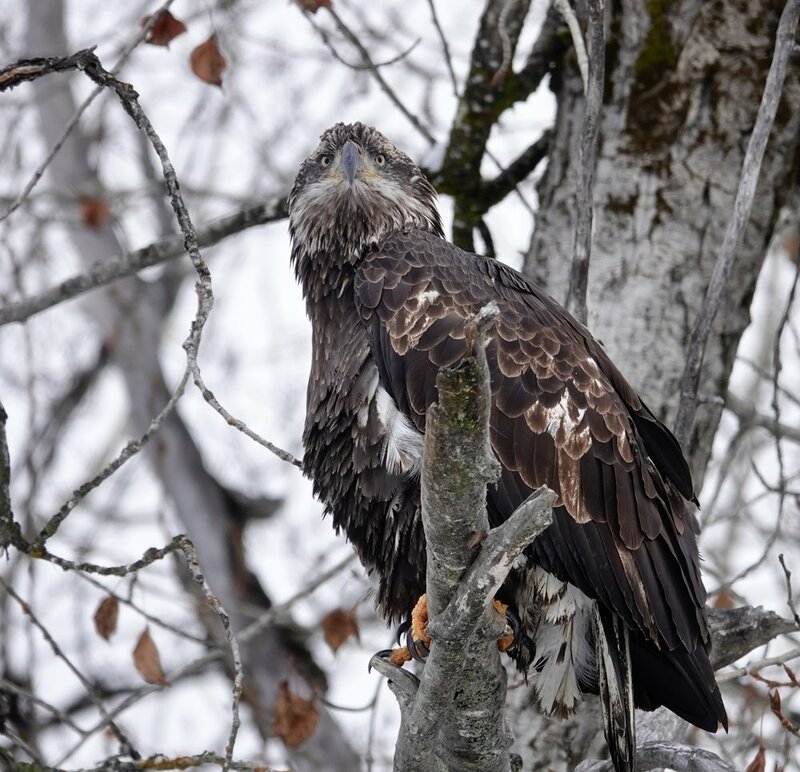 “Where do eagles roost during Minnesota winters?” Bald eagles find shelter in protective areas, in brush, branches and conifers, which reduces exposure to wind. These microclimates hold heat more efficiently than do open spaces. An eagle’s 7,000 to 7,200 feathers are effective insulators and its large size helps it retain heat. “Do chickens sing?” I think they do. Chickens make a wide range of sounds and communicate with one another. Roosters sing loudly when they crow, and they call hens whenever they find a tasty treat they wish to share. Hens cackle after laying eggs. It’s better singing than I hear from many humans. “Do vultures have enough carrion space when they fly?” No, and they don’t fly cheep. Vultures asked that I remind human fliers that just because it has a handle, doesn’t make it carry-on luggage. Turkey vultures generally eat mammals, but feed on other carrion such as birds, reptiles, amphibians, fish and invertebrates. I’ve seen them eating rotting pumpkins. A vulture prefers freshly dead animals, but wait for carcasses to reach a condition that George Foreman wouldn’t consider grilling. This makes it possible for the vulture to pierce the skin. This count produced 44 species on Dec. 29. There were 104 wild turkeys and 17 pheasants counted, more Eurasian-collared doves than mourning doves, and seven pelicans. Other birds seen included: Brown creeper, golden-crowned kinglet, white-throated sparrow, northern shrike, northern flicker, song sparrow and red-winged blackbird. No robins were spotted. The highest numbers in descending order were: House sparrow, rock pigeon, dark-eyed junco, horned lark and American crow. “Faith is taking the first step even when you don’t see the whole staircase.” — Martin Luther King, Jr. The blue jay tried to hide from me. 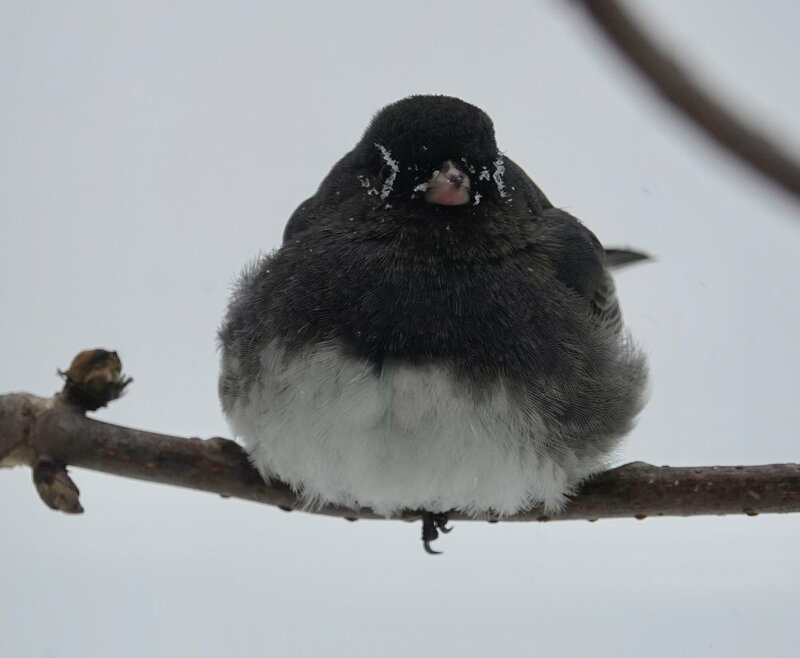 The junco’s snow goggles were made from real snow. A red-bellied beauty, otherwise known as a red-bellied woodpecker. When a woodpecker hangs around the suet, it hangs around the suet. Sundogs follow the sun as a dog follows its master. 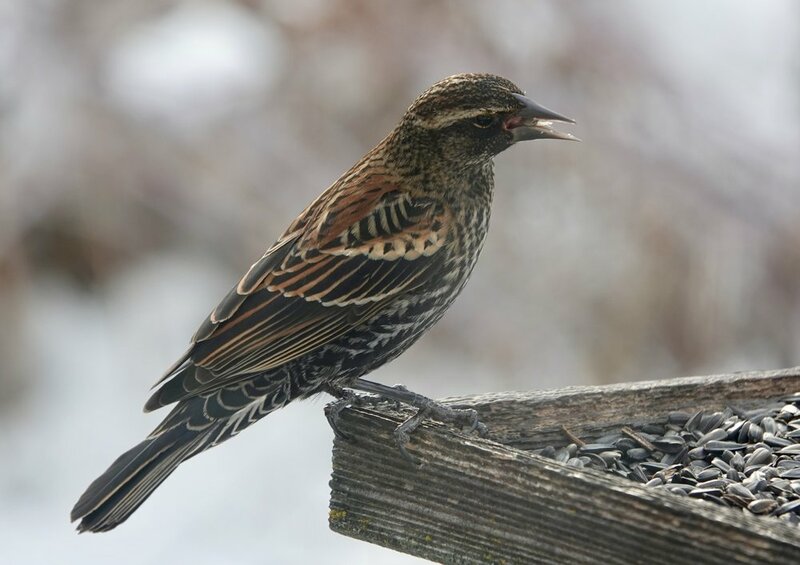 A red-winged blackbird drops by for a bite at the Batt bird table. I like looking at a house finch.